Naming a cat is a wonderful honor. If you’re a new pet parent, as well as a fan of movies from the Marvel Cinematic Universe (MCU), we can help you get started on finding the best name possible for your kitty! You should pick a name that captures your cat’s personality. Whether your new kitty seems like a sweet little hero or a mischievous villain, you can find a name to suit your new family member from the MCU. Would your cat like to live in the Marvel Cinematic Universe? They can have the next best thing–a Marvel character name! Avengers: Endgame is coming to a theater near you on April 26th! I already know a cat named Nebula. It’s a great name for a cat! There are lots of awesome potential cat names on this list. 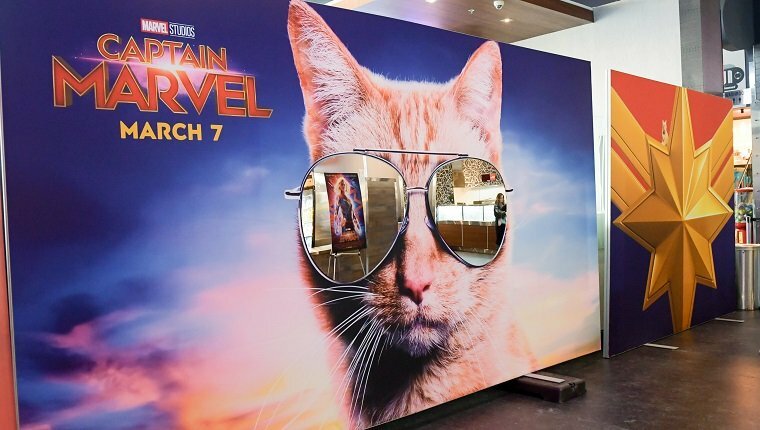 If you haven’t seen Captain Marvel yet, you have one more reason to go. Not only does it have an awesome female lead, but a scene stealing, feline co-star. A tabby cat named Goose has gotten lots of ink. Get out there soon or catch it when it becomes available on Blu-Ray in June 2019. Finally, a superhero inspired by a cat! Black Panther is paw-some, and now you and your kitties can watch it on Netflix while it’s available! There are lots of fun names in Ant-Man And The Wasp. If you haven’t seen it yet, you and your kitty can currently catch it on Netflix! Your cat might enjoy the scene where Ant-man summons an army of ants. Does your cat like fun action films with awesome soundtracks? I thought so. If that is the case, I recommend Thor: Ragnarok. You would think that “The Immigrant Song” by Led Zeppelin was written specifically for Thor. Spider-Man: Homecoming is a fun action film that the entire family can enjoy. Check to see if it’s still available on Starz. You can make popcorn and watch it on the couch with your kitty and a blanket. The newest movie in the series, Spider-Man: Far From Home, hits theaters on July 5th, 2019! Guardians of the Galaxy vol. 2 is one of the most popular of the Marvel films, and a definite favorite of mine, as well. The magic of Hollywood does a fantastic job in the beginning making Kurt Russell look really young. Baby Groot could not be cuter! Check to see if it’s still available on Netflix. It’s worth a cozy couch viewing. Captain America: Civil War is an action-packed fun! If you haven’t seen it, you should. Chris Evans and Robert Downey Jr. are two of the best, most charismatic superheroes! It’s available right now on TNT if you happen to have that. If you like magic portals and wizards, maybe you will be able to find a cat name from Doctor Strange. I love Benedict Cumberbatch! The movie is available for purchase on most streaming services. Iron Man is the Avenger who started it all in the MCU. The first movie in the series changed the game for superheroes in film, and without it, we might not have all the amazing Marvel movies we have today. Check out these names inspired by the Iron Man series. Doctor Wu is a great name for a cat! Don’t make this cat angry. You would not like him when he’s angry. Some movies feature Marvel characters, but aren’t part of the MCU–yet. But as Disney buys studios left and right, there’s no reason these characters–with great cat names–couldn’t appear in the MCU in the future. Many of us have a Negasonic Teenage Warhead–“coolest name ever!”–in our human families. She’s always on her phone and disinterested in everything else. Maybe that describes your disinterested kitty! Venom is one of my favorite Marvel films. Tom Hardy gives a stellar performance. It’s currently available on Starz, Amazon, and VUDU. Fun cat names from the film include: Eddie, Dora, Cletus, Lewis, and Emerson. Maybe your kitty needs a cool cat name from a cool series: Blade, Deacon Frost, Whistler, Quinn, Nyssa, Scud, Nomak, Chupa, or Priest. It may not be the greatest superhero movie, but it provides names that might suit your kitty, including: Murdock, Elektra, Fisk, Bullseye, and Wesley. Share With Fellow Cat-Loving Marvel Fans! If your friends have taken home recent furry additions to their families, maybe they’re looking for an awesome hero or villain cat name. If they’re fans of the MCU, share this master list with them for inspiration. I wouldn’t mind a parallel world where heroes like Black Panther keep dark overlords in check or where funny, sarcastic heroes like Deadpool, beat the living crud out of villains like Ajax and his crew. Of course, I’ll settle for this universe where I can curl up with a good kitty and watch epic battles from the comfort and safety of my own couch! Do you have a favorite Marvel film? Is your cat named after a Marvel character? Which names are your favorites from the list above? Let us know in the comments below!